The main purpose of this page is to utilize some wonderful NASA developed interactive web pages including the most important for the study of lift -- FoilSimIII. Originally, simple links to the NASA website for these pages would have sufficed. But we unfortunately we now live in a world where we have traded security updates instead of maximum functionality. So begins the slow death of the Java Applet. According to the Java Website, Java Applets will continue to be supported through version 9 (current version is 8.131). Although the intent of this site is not to give a computer lesson, I believe there are many whose curiosity demand at least a simplified version of why things that did work, no longer do. Others can just accept that modern tech changes fast. The point is NASA's interactive websites that worked great in the past no longer can be run in most browsers and many of the remaining browsers plan to stop supporting Java Applets. Note: Firefox ended support with of Java Applets with it's Version 52 released in March, 2017 and Microsoft Edge as part of the Windows 10 package never supported them. Java is a programing package that was designed to run on any computer platform, not just Windows and Mac. Even newer more portable device platforms can use it. The Java platform consist of two independent languages: Java Script (which runs as code within a HTML web page), and Java (which is independent of any browser and can create it's own user interface window). The use of these languages do not normally create any issues as long as the user has a good virus scanner installed. There is (or was) a third method of using Java -- the Java Applet. This was when the browser allowed a Java program (much more powerful then Java Script) to run as part of an HTML page. This became a valuable tool for any one with a web site; unfortunately, this included hackers and other malicious users. Although Java Script, when alone, still works in web pages, the browser will no longer allow Java programs to run. *A Portable App is a program that does not need to be installed or register on the computer it runs from. In fact it can even run from a flash drive on any Windows computer, even if you don't have administrative rights to that computer. FirefoxPortable (old version) would allow running the NASA programs from a flash on someone else's computer. If you do decide to use FirefoxPortable as the browser, the first time you open it you are going to get a request to update. 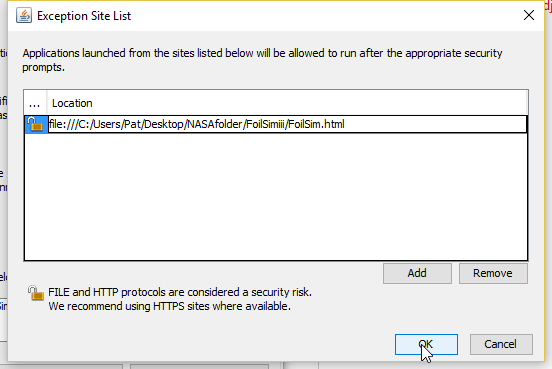 Just click on the "No thanks, I'll risk it" option, then open one the NASA instruction pages, and set this page as the home page. Only one last thing to do -- set FirefoxPortable to never check for updates. While the new home page is open, click on the Tools tab at the top and select Options, Click on the Advanced tab. UNCHECK all three boxes for updates. Click OK and we are done!!! Now download the zips of the NASA software you would like to run and the zip of the Portable Firefox (if required) into a newly created folder. A folder with a name like MyName's Science Project Files will keep others from using it by mistake. You can also check out the NASA website for additional downloads -- just remember these will contain external links that should be avoided in a vulnerable browser. Next, create a sub folder called Zips just to have a future backup of these files. Now you can unzip each zip file and then move the zip file itself to the Zips folder. 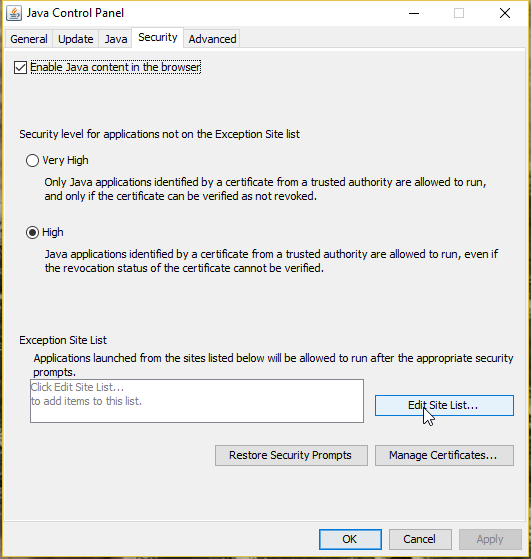 Before attempting to open one of the app files available we must add it to the Java control panel as an exception on the exception site list. To do this, first we must go into the Java control panel. I am showing the steps for Windows 10 by going through the apps menu. 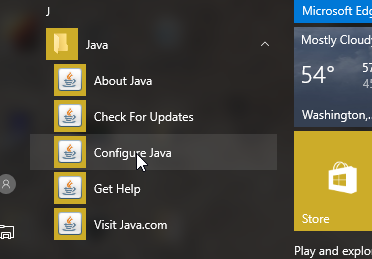 Simply scroll down the menu and click on Java then Configure Java. (For Windows 7 or 8 you may have to go to C:\Program Files (x86)\Java\jre1.#.#_###\bin and open up javacpl.exe just use highest version number if more then 1). 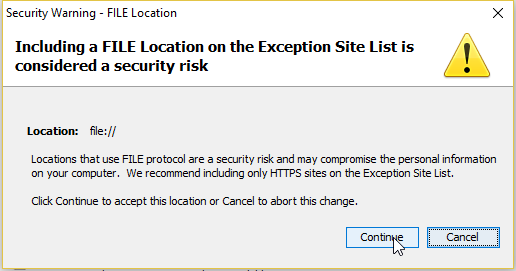 NOTE: Because the exception list is in the Java control panel (and is a registerd application) you may have to have administrative privileges on the computer you want to run the program on. Either way (through start menu or through explorer) this should open up the Java control panel. 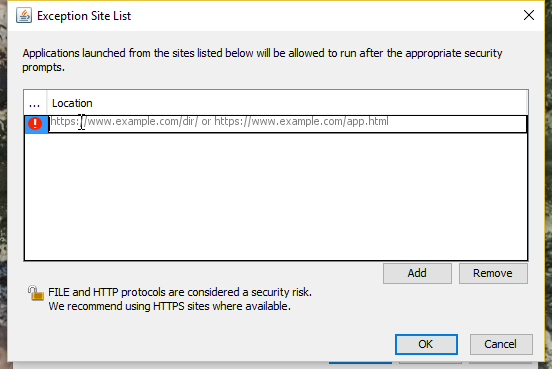 At the end of the options is a link to the security tab. Clicking this will take you to the location where you can add the files you want to run. 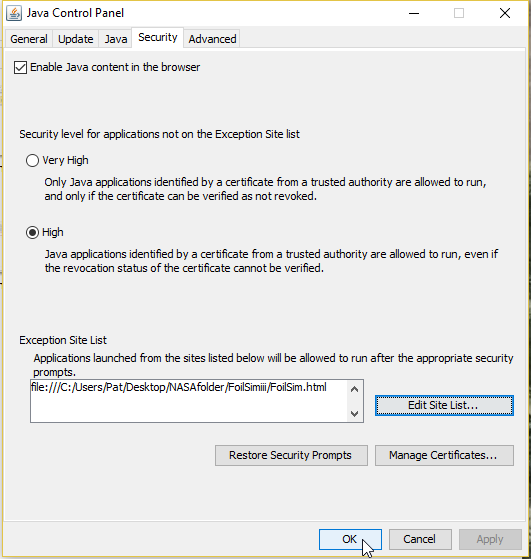 First make sure the "Enable Java content in the browser" at the top is checked. Now you can click on the "Edit Site List" button. For each page you want to add you must type the complete file location of page with the Java Applet you want to run. Unfortunately, NO type of cut and past is allowed. However, you are at least allowed to edit a mistype without starting over. When you have added all the sites click Ok. This will bring up a security warning message. Click on the Continue option. Once the security tab is back re-click Ok. The pictures below should give you an idea of setting up the Java control panel and finally get working programs!!! Full Version FoilSim III - A NASA developed software to show airflow over a wing at different angles of attack. 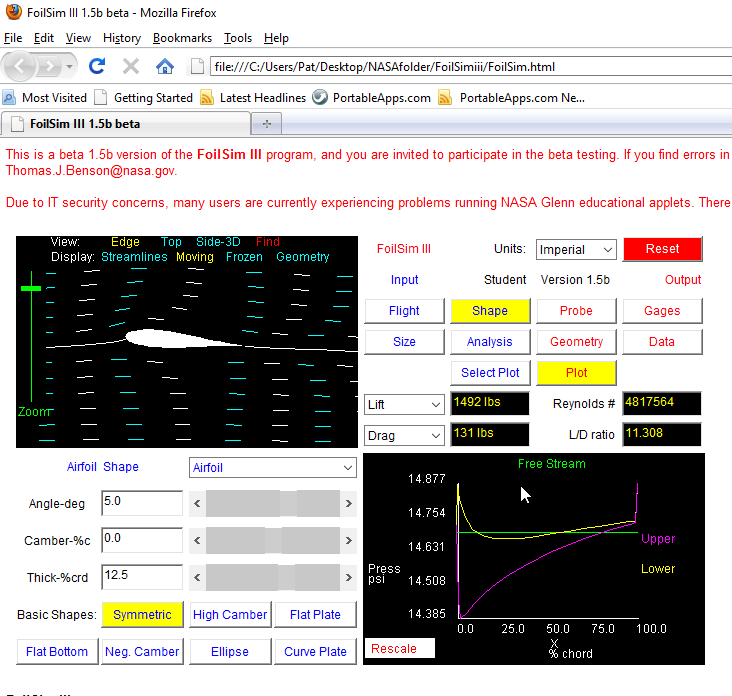 Kite Modeling Program - A NASA developed software to show airflow parameters of a kite based on selected design criteria. Rocket Modeling Program - A NASA developed software to show flight parameters of a model rocket based on selected design criteria. ReynoldsNumber Program - A NASA developed software to show changes in Reynolds Number based on selected criteria. Gas Lab - A NASA developed series of locally linked web pages showing differnt Gas Laws. No Java Applets included so no Java exceptions required. FirefoxPortable - Old version needed to run NASA apps in a portable mode. List of NASA Aerodynamic Sites - Link to the NASA Aerodynamics Web Page Index.